If you’re into crafts, then you already know what you’ll gift your mother because you know what you can make: jewelry, knitted or crocheted items, etc. But what do you do if you’re not good with your hands? Well, Zazzle may be the answer. Following are some suggestions that your mother may enjoy. 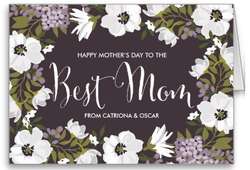 They include pillows which you can personalize with text or a monogram, monogrammed mugs and travel mugs, posters and canvases with (I hope) beautiful photography, and yes, designer chocolate, bars of chocolate which you can create to your heart’s desire, with all the toppings your mother enjoys. You can also buy brownies which you can personalize with your own photography. I’ll start with a personalized Mother’s Day card because cards seem to be more valued these days than they ever was. Some of us used to send cards for Christmas and other occasions and now so few of us take the time to write anything by hand. When we do however, we give our dear ones even more pleasure because such gestures have become rare these days. Here’s a lilac anemone Best Mom card. There are plenty more to choose from on Zazzle. If your mother loves flowers, then you can get her a monogrammed mug. There are beautiful customizable mug designs on Zazzle, and also some where the design already involves a certain initial, such as the one shown below to the right, with the letter N, morning glories, and a butterfly. So if your mother is Nicole, Nicola, Nina, etc., then this mug may be something she would enjoy. If your mother enjoys gardening and grows roses in her garden, you can get her a pillow with a photo of white roses. White flowers are harder to photograph than blooms of a different color, because the sun creates reflections which turn parts of the photo paper-white. The result is not nice. So even though your mother may have white roses in her garden that she has photographed in the past, these roses I present here may be a more pleasant image. This pillow is printed on both front and back. Certain slogans are popular with writers. One of them is “Careful, or you’ll end up in my novel.” Writers usually buy this statement on mugs and T-shirts, so I’m presenting both. My own versions of this phrase are created on a background with the faces and silhouettes of women. They print rather nicely, and add an extra layer to the fun of the statement. The T-shirt is available in many colors and styles. There are things writers do to earn a living, and writing they engage in because they can’t live without it. If your mother spends much of her spare time at her keyboard, then you and she probably know why she does it: because she’s compelled to write, because it gives her the kind of satisfaction she finds nowhere else, and, yes, because it keeps her sane, taking her mind away from the many unpleasant things she’s dealt in life and which she can’t change. This quote is by Pablo Picasso, and it will be appreciated by many who have novels in them but can’t always drag the words out. It’s a proven fact that if you persevere, if you sit down at your desk reading and rereading your writing and musing over what to write next, inspiration comes. As with everything, writing too is 1% inspiration and 99% perspiration. This is a quote from J.W. Goethe. I enjoy it because it seems that the more we write about our life, the less we know about ourselves. And the things we learn are often not concordant with the image we have formed of ourselves. So this quote by Goethe, "I do not know myself, and God forbid that I should," is quite in order. Whether these phrases remind you of your own interactions with your mom, or of your mother in a dialogue with your father, I hope they will make your mother smile on her day! Zazzle has 69 different toppings for their customizable chocolate. Here are some of my favorites: almond, blueberry, and cherry; and peanut butter and Oreos. You can choose one of these, or you can make your own chocolate bar. Zazzle has three chocolate bases: dark, milk, and white. And here are some of the toppings: hazelnuts, macadamia nuts, pecan halves, walnuts, whole almonds, slivered almonds, organic cashews, roasted organic peanuts, roasted pistachios, butter toasted peanuts, honey roasted cashews, dried strawberries, fried cranberries, dried raspberries, dried cherries, mango, pineapple – you get the gist. A designer on Zazzle has created Mother’s Day brownies with an image of cherry blossoms. I quite like it. You can keep this image and change the text, or you can use your own illustration or photo and text. Zazzle sells their brownies by the dozen, so your mother will have plenty to share. I think it’s a nice idea to have custom-made sweets because most of us have a sweet tooth and indulge it, and such a gift is therefore very likely to be well-received. I hope I've given you some ideas that can surprise your Mom this Mother's Day. Have a happy holiday! You can't miss with custom chocolate! As a writer I have a pleasure to give my own books to people for birthdays or at similar occasions as a gift but I still bet on chocolate when I have to bring a present to a lady. Mira, Everything is lovely, particularly the pillows. What do you think of white chocolate? It's the chocolate that I find not too rich. Yes, they have chocolate and several other kinds of sweets as well. I like that their chocolate is customized for anniversaries, retirement gifts, get well presents, and so on. Wow Zazzle really has a lot to offer, I haven't created anything there, but enjoy looking around now and then. I didn't know they had chocolate now. Thank you, Candy! I, too, think the sweets are a great idea. Zazzle constantly adds new products to its lineup. You've offered a diverse selection of gifts. There's something for everyone! Love the brownies!! Mugs are a wonderful gift for mom, and you have a fun selection here.